Chi Kri’s exclusive Hip Hop Yoga Workshop with Neil Patel! After the success of last year’s workshop, Neil Patel returns with his urban music box ready to sync you all up to his Beatbox and get you fit the rapping yogi way! Yes, not only will Neil be taking you through some of the dynamic sequences of Hip Hop Yoga, but he’ll also be rapping and teaching at the same time! Never been done before – not even in the USA! So if you want to get fit, be entertained, and try some of the breakdance style yoga poses he’s got lined up, you need to hit the Yoga Studio! The Vitality Show is on the 26th and 27th of March and Neil will be at the Yoga Studio for an hour from 3pm on each day! Do not be late or YOU WILL NOT GET A SPACE! "Don't come to watch, come to PRACTISE WITH ME! I want to see hands moving, some legs jammin' and some co-ordination up in here! I WANT SOME PERFECTION!!" So I wil see you there!!! 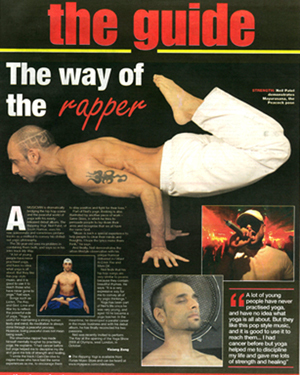 Hip hop and yoga started to find each other back in the early 90's when yoga teacher and rapper Neil Patel (also known as N1) was reluctant to let either passion go from his life. he says: "for me, whether it was writing raps or meditating; practising yoga or creating hip hop music - it all came from the same place - the heart and soul. One was more tangibly expressive and the other was little more introspective, but they were like two sides of a coin and I felt they could share the same space - that I could love and represent both! Why not? Neil then went on to introduce yogic philosophies into his music and more radically, rap music into his classrooms! "at first students were a little surprised to hear the Fugees or the Notorious B.I.G. whilst they practised, but when they saw how it helped keep their timing in the sequences, they liked it... and it's not just rap, I will also use RnB and my traditional Asian fusion Indian music from great artists like Nitin Sawhney.."
As people started to come and review his work it became apparent the new yogi on the block was onto something! METRO Newspaper recently came down to review Patel's yoga and the rather startled young journalist was quoted as saying "it's the fastest I've ever moved in a yoga class!" The situation now is that BBC TV, Body in Balance TV, and Fitness TV and all of London's major nightclubs like Sound, Tiger Tiger, and Metra have supported and held classes in this innovation. It's still all very fresh in Neil's mind, and his attitude towards yoga itself seems quite interesting considering he is so heavily involved in hip hop. "I think the hip hop world actually NEED yoga to give the huge phenominon that rap has become some grounding and sense of spirituality and purpose again; and I think the yoga world needs to embrace rap as being the poetry of the modern day. As a rapper myself, I know exactly the sensivity and self-tuning a rapper needs to have to be able to produce quality lyrics. I don't like the arrogance and egoism that follows the yoga world. I find more ego in yoga than in rap! People always say rap is this and that... but yoga people can be just as egocentric. Ego is a human problem, not a rap thing"
Naturally outspoken, Neil's catalouge of music is quite astonishing. He built a very small but dedicated following of listeners in the yoga world and aims to one day bring his own music into his classes, but doesn't stop at just promoting his own work. "I want open mics at my hip hop yoga classes because self expression is a gift we should all have. I want to give people a space to take a poem, a rap, even a song - and share it after class. You don't have to, you can just watch! And I won't do it every class either! But I know in my life and music, that moment when you speak from your soul is a beautiful thing"
Neil Patel's passion for his work is an obvious selling point, and through his 19 year teaching career you just get a sense that he's going to go from strength to strength doing exactly as he pleases! About Hip Hop and Yoga! Hip hop culture is deep. The actual music is one small part - there is self expression, breakdance, performance, clothes, art, and most of all... the FEEL of hip hop - which is bold, brave, and in your face! Hip hop was born out of a need to express, coupled with simple human resourcefulness. Hip hop is the attitude of endevour, spirit, and confidence. Hip hop is the single most important part of modern culture; it has defined the sound and look of the street since the 80s. Yogic culture is deeper still. The postures and exercises are one thing, but it's the mental and spiritual (yea, spiritual - don't be afraid to learn about this!) aspect of yoga that is key. I grew up in a yoga teaching household whilst practising my hip hop arts. It was the yoga that gave me the strength, health and wisdom to get through life. It gave me power over my mind and body and knowledge of self, and of the Higher Powers. y have you chosen to mix these two subjects? Hip Hop Yoga is a fusing together of two of the most influential lifestyles in the society we live in today. Hip hop culture has provided and influenced a huge amount of the music we hear on mainstream radio, most of the urban fashion trends we’ve had since the late eighties (like baggy jeans, hoodies, baseball caps, bandanas, trainers etc) and countless other cultural aspects like slang. Phrases like “Chill out” which are commonplace today originated in hip hop culture in the 80s. Yoga on the other hand has virtually singlehandedly given depth to what is arguably a materialistic culture which was in danger of eating itself alive with self-indulgence! Since yoga arrived on UK shores close to 100 years ago with passing yogis like Yogananda, it has saved thousands of spiritual seekers on this fair isle from drowning in the shallow waters of religious dogmatism. Yoga has given people autonomy over their spiritual growth and hip hop has given “the kids on the street” their own voice and expression, both have, in different ways been revolutions for humankind. You would be surprised! Hip hop is based on poetry. Rappers are basically urban poets. I would say at least 75% of all spiritual scriptures from India are written in verse! And certainly many of the “Bhajans” (Hindu devotional songs) that my family have grown up with have all rhymed! So it’s just about the content of the rhymes – sure some rappers lyrics leave a lot to be desired, but others are truly poetic like Taleb Kwali, Common, KRS1, Chuck D, and even rappers like Eminem have had a lot of insightful lyrics. Then there are the movements! Break dancing and yoga poses are not dissimilar. In my gym I show all the guys the moves like peacock, handstand, crow, headstand and they can’t believe it! Even my break dancing friends want to learn the power poses to help them dance! You also have the fact that both hip hop and yoga are ethnic pastimes originally, so share the same slow and steady influx into western society. And finally me being a hip hop producer, rapper, and yoga teacher – they have ME in commonhave you done this? What will you achieve? I think the hip hop community which I have grown up in could really benefit from yoga being presented to them in the right way. There are lot of young people from my era who love hip hop but weren’t lucky enough to find the stability and peace that I did through yoga. My mother Tara Patel was as yoga teacher from the early 70s in the UK so I was fortunate enough to have it ready for me when my teenage world started to crumble! 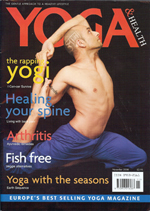 Yoga saved my life as many people know I was given a terminal cancer prognosis at 27 but used yoga and associated therapies to effect a stabilisation without medication. You see, I want “my people” to know all this, but I can’t preach “at them”, I have to meet them where they are and slowly drawing back to the truth about life, which yoga reveals to discerning students. All the gun and knife crime on the street is because kids have no inner peace! It’s not the media, it’s not the parents, it’s their own peace. I think the yoga world needs to know about hip hop as well! I have openly said that I see more egoism in the yoga world than in the world of rap – and I know both well. Hip Hop knows it’s not pure and doesn’t pretend to be. But in yoga, you have ego freaks running around reciting mantras and regurgitating scriptures, teaching one or two classes and now they are special? Sorry, it doesn’t wash with me! And this elitist attitude can make them look at hip hop as some vile expression of a bad tempered youth lost in the gutters between mindless lyrics and heavy bass lines! It’s basically time for everyone to stop being so judgemental... and open the doors to another side of life. Ok, but swearing? I hear you classes have uncensored lyrics in your class! Yogic or not? I don’t like to judge genres of entertainment too harshly. I mean if you are the kind of person who has to stop watching TV after the watershed, or cannot go to 18 plus movies, then sure, my classes are not for you. I accept that. But the hypocrisy of people who appear to have never sworn in their lives then lambasting an entire movement or hip hop yoga class based on the occasional uncensored word strikes me as rather petty! God would not refuse His love to a person who has sworn would He? God would not have said, “I am sending yoga down to earth, it must be given to all.... except those who listen to hip hop in its uncensored form... now where are my sheep?” So if God won’t judge, then I won’t either. If someone criticises the class based on a swearword I would respect them only if they never swear themselves, or refuse to watch 18 plus movies or TV with swearing. Hip hop yoga is very different to other forms of yoga I teach, I would understand totally if this was in my Chi Kri Yoga classes, or a regular hatha yoga class... but in a hip hop yoga class you have to be a little less sensitive. Who in the Hip Hop or music world inspires your yoga practice? Good question! There is a chap called Russell Simmons who started one of the most powerful hip hop music labels of in the eighties called Def Jam. He went on to become a multi-millionaire before turning to yoga and meditation. He embodies both worlds so nicely. That inspires me to keep going with hip hop yoga and my yoga inspired rap music. In yoga, it is the warrior spirit, the Tapas in the Niyama series, the fire to burn away the dross of doubt and negativity that drives me. I like the artist Prince for his constant determination to be creative and fearless. This inspires me to be myself and express myself freely and openly. I think this helps my throat and heart chakra a LOT! Prince has always been a bit “out there”... but remains confident in who he is. I like that in people. I also like rappers like Chuck D, Eminem, and Ice Cube for standing up to situations in life that felt were unjust. For me that is about being grounded through the root chakra and practising Satya, Truth. Who know what Truth is? But to have the courage to believe in yourself is also a skill people who are holding balancing poses can relate to! Hip hop is confidence, confidence builds in yoga also. Do you find more youngsters interested in yoga because of this new approach to yoga teaching? To some degree, generally my classes are full of young spirited people anyway; but there are probably a higher percentage of under 35s in the hip hop yoga class. But the hip hop generation starts from the early eighties.... so many people from 18 to 42 share the same culture. Look at Jay Z, he is 40 I think... and he’s at the top of the rap game in America! Jay Z was one of the main reasons I started Hip Hop Yoga! He is starting to take an interest in the subject. Jay Z even asked Coldplay’s Chris Martin to teach him a few moves! All of this helps younger people feel that yoga can be an acceptable part of “street” culture as it were. Ok, so what happens in a regular Hip Hop yoga class? How do you manage to fuse the two subjects into one class? Well first of all we look for venues with really good sound systems! We’re currently at Sound Nightclub in Leicester Square which has an awesome sound system and DJ Booth... this music provides the backdrop for the synching and choreographing of moves that go on in the class. What you have to understand about hip hop yoga is that the tempo is the all important factor. I will start freestyling movements from yoga and hip hop and timing them with the beats. People get to stretch but also to work in a rhythm – and to enjoy the music! Then we take classical yoga sequences like the Surya Namaskar and flip them up with beats. This is something I’ve done for years in my other classes! We also use Chi Kri Yoga sequences which are also music based with beats I have composed. We then get the hip hop on again and do the breakdance and yoga “freezes” or holds. This is great fun. After that its either a meditation session, a relaxation, some breathing, or an “expression session” where people who rap, sing or dance can express themselves for a few minutes. Sometimes I will rap some philosophical lyrics from my album if I’m in the mood! Compared to the subtle lighting and soft sounds of a yoga studio, how does the nightclub atmosphere compliment a yoga practice? Times change and so does where and how people practise yoga. To me life ebbs and flows, cultures and creeds mix, arts and artists mix and match as do religions, faiths and environments. Ultimately, what is True will always rise to the surface and what does not work or matter will fall. The thing is this, yoga is so powerful, that wherever you do it, it will have an effect. People have questioned to nightclub approach, but again as I keep saying, why not? What right do we have to hold yoga back? It will always exist in its pure form somewhere so it’s roots will never die.